Car buyers in search of an affordable new car that is sporty, high-tech and fun should get into the 2018 Chevrolet Sonic. This city-sized and urban-styled car from Chevrolet can be had in hatchback or sedan variants, making it a versatile choice for a small car. Even with its highly affordable starting price, the 2018 Sonic comes well-appointed with modern, high-tech features, and can be fitted with advanced safety systems, too! 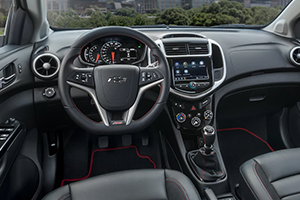 Drivers near Baker and Central, LA can shop All Star Chevrolet North online or by visiting our dealership to explore the 2018 Chevrolet Sonic.Keep reading to learn why the 2018 Sonic is a standout in the small car segment, then contact or visit All Star Chevrolet North for a tour and test drive of this sleek Chevrolet! 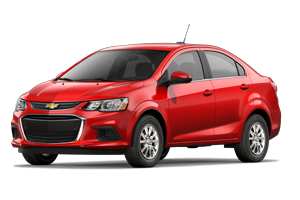 With its optional 1.4-liter turbocharged 4-cylinder engine, the 2018 Chevrolet Sonic brilliantly blends fuel efficiency and that fun-to-drive feeling that can be lacking in an affordable small car. The Sonic's advanced turbo-four engine can be paired with a manual gearbox or automatic transmission; either way, the 2018 Sonic is sporty, fun and mighty fuel-efficient! Chevrolet has packed its 2018 Sonic subcompact car with smart safety features that aid in control, protection and driver alertness. For one, every 2018 Sonic gets ten airbags and a high-strength steel safety cage as standard, plus a rear vision camera to provide an extra set of eyes when in reverse gear. With the available Forward Collision Alert, Lane Departure Warning and Rear Park Assist systems, the Sonic's safety is taken to another level, thanks to driver-assist and alert features. Plus, with its agile and lightweight nature, the 2018 Sonic can quickly react when the driver is alerted to changing traffic around the car. Stay safe in an affordable small car with the 2018 Sonic from Chevrolet! 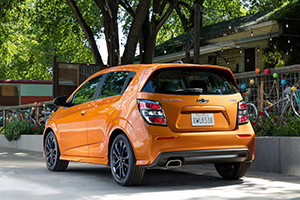 If you prefer the sporty styling and versatile nature of the 2018 Chevrolet Sonic hatchback, then you are in for a real treat, as the Sonic hatch boasts a maximum cargo capacity of 47.7 cubic feet! The sleek 2018 Sonic sedan is surprisingly spacious, too, as it offers nearly 15 cubic feet of cargo room in the trunk -- which is greater than many compact sedans! 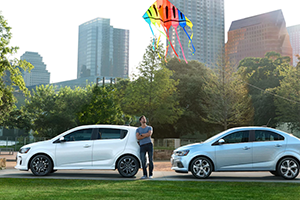 All Star Chevrolet North welcomes car shoppers near Central and Baker, LA to our dealership and service center to discover the 2018 Chevrolet Sonic and other new Chevrolet vehicles for sale. Our Baton Rouge, Louisiana Chevrolet dealership proudly serves car buyers of all credit levels, so apply for auto financing online now or visit us at your earliest convenience.